A new civil rights movement is emerging in America. In the streets and on social media, ordinary people are rising up to confront injustice and to demand equal protection of the law. The ACLU is proud to defend and stand with them. Today’s civil rights movement has been sparked in large part by video images of police killings of unarmed Black men: Michael Brown, Eric Garner, Tamir Rice, Walter Scott and others. Such recordings didn’t stop their deaths, unfortunately. But these images show the American people the reality of injustice, and force all of us to confront it. Just as photographs and television images from Selma and Birmingham catalyzed widespread support for the first civil rights movement, videos posted on the internet today have renewed calls for racial justice in America. The ACLU plays a crucial role in this struggle. In addition to advocating for equal rights under law, the ACLU defends the rights of ordinary people to record the police and to protest injustice. We know that America’s struggle for equal rights requires both the ability to shed sunlight on the human cost of inequality and the right to raise our individual and collective voices to demand change. It also requires courage on the part of ordinary people, many of whom have emerged as modern-day heroes of this new civil rights movement—and the ACLU has proudly represented several of them here in Massachusetts. Three years ago, the ACLU of Massachusetts won the right for ordinary people to record the police when a young man named Simon Glik was wrongfully arrested for using his phone to record police officers punching a man on the Boston Common. Simon asked the ACLU to represent him in a civil rights case against the Boston police. He wanted to ensure that other innocent people would not be scared, intimidated or wrongfully arrested when they record the police in similar situations. The ACLU won that case, establishing a landmark legal victory upholding the public’s First Amendment right to record the police. ACLU client Wenzday Jane, who was charged with "interfering with the police" for filming an interaction between a Somerville police officer and three teenagers, speaks out on the importance of the First Amendment at the 2015 Bill of Rights Dinner. Photo by Derek Kouyoumjian. For civil liberties victories to have real meaning, however, people must exercise those rights. That’s when she called the ACLU. Ms. Jane not only stood up for her rights in the streets, she also stood up in court to tell the police officers that what they did was wrong. And because she did, the judge dismissed the criminal complaint, and sent a clear message that exercising our constitutionally protected right to record the police is not a crime. Addis Niambe Summerhill and Edward Christiaan Summerhill successfully fought charges against them of disorderly conduct and trespassing, following their participating in a demonstration for racial justice. ACLU of Massachusetts staff attorney Carl Williams represented the husband and wife Boston schoolteachers. Photo by Derek Kouyoumjian. The new civil rights movement also involves people marching in peaceful protest to demand equal rights. 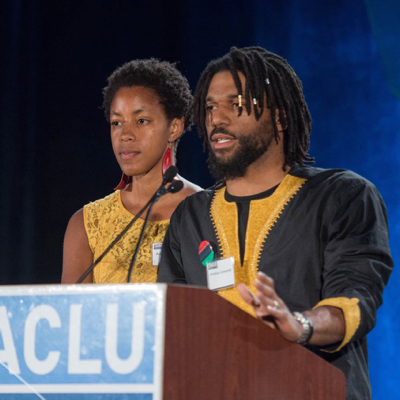 When two Boston public school teachers, Addis and Christiaan Summerhill, were arrested with others in a peaceful protest calling for fair treatment under the law for Black people, they called the ACLU. Unlike other protesters, the Summerhills refused to accept a plea—a reduction in charges from criminal to civil, with a small fine. In taking a plea, a person first has to accept the prosecutor’s assertion that they broke the law. The Summerhills refused. They knew they had done nothing wrong. They had not broken any laws. They did not trespass, resist arrest or create disorder, and they wouldn’t lie, even to reduce the charges. Mr. and Ms. Summerhill insisted on having their day in court—and the ACLU was honored to represent them. The Summerhills told the court the truth, and the Boston Municipal Court judge agreed. They were found "not responsible" for any wrongdoing—a vindication of the stand they took for civil rights. It isn’t easy to challenge the government. Reasonable people—in fact, most people—reasonably fear the consequences. That’s why the Summerhills’ stance is so courageous. They stood up when they marched, along with thousands more that cold December night. They stood in police handcuffs and police cells that night. And they stood proudly in court to defy the attempt to prosecute them for Disorderly Conduct and Trespassing. Addis and Christiaan Summerhill, Wenzday Jane and Simon Glik all stood up for themselves. But they also stood up for those who can’t—and for all of us. The ACLU is proud to defend their rights, and to recognize them as modern-day civil rights heroes in our midst. Carol Rose is executive director of the ACLU of Massachusetts. UPDATE: On June 23, 2015, the Boston Globe reported Christiaan Summerhill's dismissal. You can learn more and find a petition to Boston Public School officials here. Top photo of Dec. 4 demonstration near Boston Common by Marilyn Humphries.